It wasn't too long ago that PocketWGU crossed the 1k and 2k marks. Now at 3,600 users and growing, the PocketWGU DevTeam is pleased to welcome Kindle Fire owners into the fold. At some point during the last week Amazon added the PocketWGU app to the app store on the Fire. To install, simply search the Kindle Fire App Store for "WGU" tap on "Free" and then "Install". Easy peezy! Should I be able to open the e-text readers from my Kindle Fire? For links to eBooks inside the Course of Study, you may click these links to open the "web-based" eReader site (e.g. 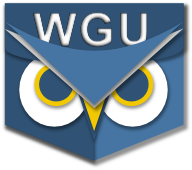 CourseSmart or SkillSoft) from within PocketWGU. This should work as long as the eBook provider has a web-based option. The text will show in the browser built into PocketWGU. I think that maybe you're asking about those eBook providers that have a native Android application (like CourseSmart and VitalSource). If you install those applications onto your Kindle Fire, it would be nice if PocketWGU would automatically launch them from the link in the CoS. Is this what you are asking about? If so, the answer is currently "no", but it may be possible to add this feature in the future though. I'm not sure if I'll be able to automatically log you into the native app, but I should at least be able to launch it if its installed already.